I don’t know if all grocery stores do this, but at our grocery store the cranberries are “buy one get one free” during the holidays. And I don’t think it’s one of those situations where you can say, can I have one for half off? King Soopers would say, “No, we sell these once a year and we are getting rid of them all, now take them and go.” Side note – I could start a weekly column about what terrible or annoying thing happened to me at the grocery store last week. I could have guest columnist talk about how they had 4 employees searching for the wasabi powder and when it was finally found she got it for free due to the hassle. Or how the deli guy didn’t seal my bag of pepperoni, so when I grabbed it, pepperoni was flung to all regions of the deli and cheese section, and even a little into produce. Actually, something happened last week that was so funny/horrifying that I was thinking of starting a regular Monday blog post about the embarrassing thing that I did last week. I can think of three things off the top of my head. And they didn’t all happen at the grocery store. One was at Target. So why did I buy cranberries anyway? We have been making Cranberry Orange Relish on Thanksgiving ever since Grandmom introduced us to in in 2007 or so. (Click here for the recipe) It’s very good, and bright, and delicious. A tablespoon on your plate with the rest of Thanksgiving is completes the meal. But even with 18 people eating a tablespoon each, you have some leftover, not to mention that entire second bag. (Guess who’s having cranberry relish for Christmas dinner!) Long story short, I decided to invent a recipe to use up the leftovers. I combined a bunch of scone recipes and I need to revisit and refine, but basically I made the dough, split it in two and put a layer of crabberry relish in the middle. I was a little stingy because I wasn’t sure how it would turn out, but next time I would use more. The scones were very pretty and delish. 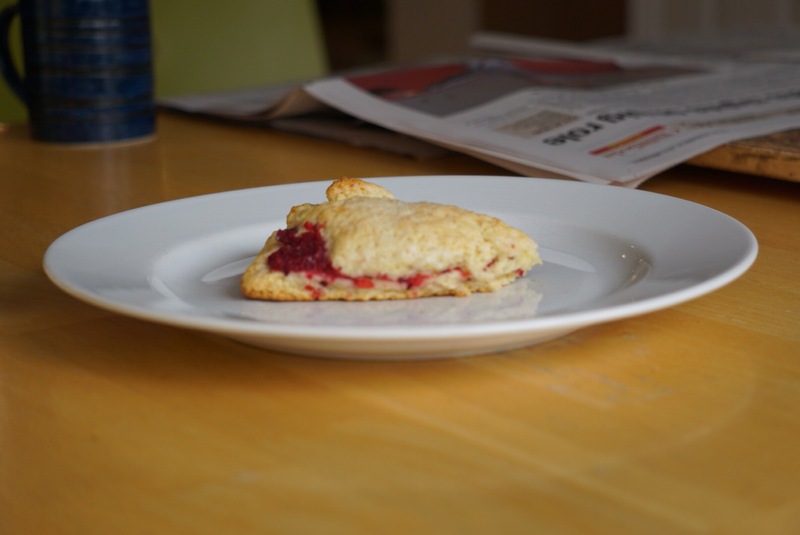 This entry was posted in food and tagged breakfast, cranberry, scones on December 4, 2015 by metamegan. mm those look so good, I might have to make some more cranberry sauce. I saw somewhere that it’s National Cookie day today! What!